Hey Jo! are returning to The Lewis Arms for festival week. We reported on their recent performance in May. Kicking off from 1pm with plenty of kids activities. Kids eat free*, face painting, crafts, fancy dress and a bouncy castle! All proceeds in aid of Tenovus. 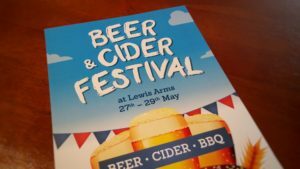 Cask ales and real ciders from: Hook Norton Brewery Weston's ciders Shepherd Neame Everards Brewery The Lewis Arms will also be serving a range of BBQ favourites including burgers, hot dogs, and other delicious festival treats. Test your general knowledge, just £1 per person entry fee.